Every animal's ultimate goal in life is to generate offspring to pass on its genetic material to the next generation. But sometimes, resources are scarce and the task of reproduction is too difficult or risky. If resources are limited and tough to find, reproductive efforts may fail anyway. In these situations, it may be in an animal's best interests to not defend a territory or to breed at all, but rather to focus its efforts on surviving to the next breeding season. Biologists refer to individuals without a territory during the breeding season as 'floaters'. A new study from The Auk: Ornithological Advances presents some of the best evidence on how changes in environmental conditions, specifically droughts, impact the social and reproductive behavior of birds. 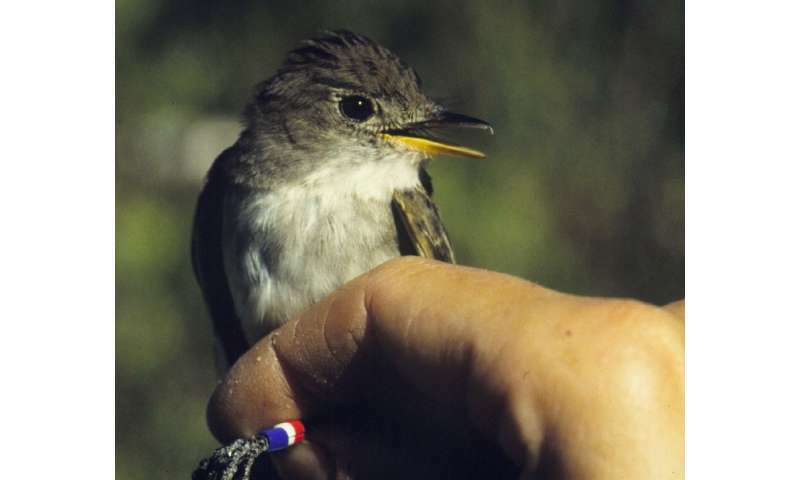 Tad Theimer of Northern Arizona University and colleagues monitored a population of Willow Flycatchers over a five-year period. Each individual in this population was marked with uniquely colored leg bands and its behavior recorded throughout the breeding season. Some of these birds defended territories that contained their nests, while other birds—the floaters—moved around the population declining territory and nest. A severe drought that occurred during the study allowed the researchers to examine how these birds respond to changes in the environment. They found there were one and a half times more floaters during the drought than during years with average rainfall, and that these floaters were more likely to survive than individuals that tried to nest. When the researchers compared how many chicks a bird had with their floater status the previous year, they found that territorial birds had more chicks than floaters—with one exception. In the year immediately after the drought, former floaters produced more chicks. There is a potential twist in the story though because the researchers did not check the DNA of the chicks throughout the study. Birds are notorious for extra-pair copulations (or breeding with another individual that is not your mate), and it's probable floaters engage in this behavior regularly. Through this behavior, they get the benefit of passing on their genes without the cost of raising the chick. As lead author Theimer puts it, "In normal years all birds try to breed, and those that don't breed lose out in long-term reproductive success, but in extreme drought years, not breeding is actually the better strategy". But this strategy of patience assumes that next year will be better than this year. As climate change increases the frequency of these extreme environmental conditions, this assumption becomes less certain.